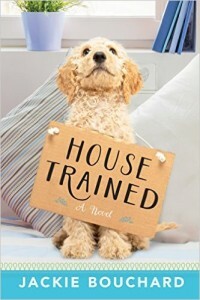 House Trained is women’s fiction novel about Alex, an interior decorator, her husband, Barry and their dog Marie. A committed child-free couple, their house is like a shrine to Alex’s exquisite tastes and one she is exceptionally proud of. She finds the brood being raised by her sister to be unnecessarily messy and annoying and her first-person narrative throughout is routinely making comparisons between dogs and babies with dogs winning out in the end. But then her perfectly crafted world (which is not really so perfectly crafted anyway, we come to find out) comes crashing down when her husband finds out he has an 18-year-old daughter and a 15-month-old granddaughter. The girls come to live with Alex and Marie and the rest of the book deals with Alex learning broad definitions of motherhood and womanhood as she and her husband deal with this development. Overall, I enjoyed this book. I really like Bouchard’s writing style, but Alex was not my favorite person to live in the head of for 200-odd pages. I am a woman who is choosing not to have children, but Christ in a jumper this woman is a yutz about it. It’s not her choice not to have kids that annoyed me, it was her disdain for them and her disdain for women and families who made the choice to have children. I also find it slightly unbelievable she knows nothing about children, having been a woman who lives in the world and has friends and relatives who have given birth. Her sister has three boys for crying out loud! I am in my early 30s and have not had a child, but I’m fairly conversant in the world of babies and toddlers because of having friends who have kids. Like, seriously. To not know anything as Alex purports not to is a conscious and (in my opinion) self-centered choice for an adult woman who has nephews. She learns quickly with the new baby and the more she showed her humanity the more she grew on me. I am not usually a fan of novels where the characters are trying to hard to show everyone they’re perfect and then of course they’re not so they crumble and rebuild (the basic structure of this one), but Alex grew on me. I’m planning on seeing if my library has any of Bruchard’s other works for comparison. There’s a lot of discussion of organic and health conscious beverages and foods in this book, but also a few mentions of chilled white wine. The choice between kale chips and potato chips is a clear one for me, and in the spirit of that, I’m giving this book over to white wine. Alex favors chardonnay, which is not my personal favorite, but follow this link for wise people’s recommendations if it’s yours. There is no shortage of blogs about interior design on the internet, but here’s my favorite. Joanna Gaines is the star of HGTV’s Fixer Upper (a favorite here at BaB) and her blog is full of small, helpful tips to make your house more form and function friendly. A plot point in this book is a house fire. This site provides a place to start if this happens to you or anyone you know in rebuilding their lives. Adopt-A-Pet: If you’re thinking about adding a furry friend to your family, consider adoption over a breeder. I received a copy of this book on NetGalley in exchange for a honest review. A version of this review also appears at Rakes of Romance.